In Hinduism, Rama is generally regarded as the seventh avatar of Lord Vishnu, although there are some schools of Hinduism which regard him as the Supreme Being. The Indian city of Ayodhya is claimed to be the birthplace of Rama. The details of Rama's life are described in the epic Ramayana. Rama is said to be "Maryada Purushottama" which can be translated as the "Perfect Man", "Lord of Self-Control", or "Lord of Virtue". Rama is married to Sita, who is the embodiment of perfect womanhood and an avatar of Lakshmi. The Supreme Person, Sri Ramachandra is here presented with His eternal consort Sita Devi. This Rama Statue is approximately 10.25" tall and 4.25" long and 2.75" deep. This exotic sculpture of Rama is a beautiful work of art on resin medium, hand painted in Bronze colored finish. Rama, holding a sword and bow as depicted by many Hindu literature, is a superior warrior and an avatar of Vishnu as many believed. Rama or Ramachandra is the seventh avatar of the Hindu God Vishnu. He is the central figure of the Hindu epic Ramayana, which is the principal narration of the events connected to his incarnation on earth, his ideals and his greatness. Rama is one of the many popular deities in Hinduism, and especially of the various Vaishnava sects. Religious texts and scriptures based on his life have been a formative component in numerous cultures of South and Southeast Asia. Along with Krishna, Rama is considered to be one of the most important avatars of Vishnu. In a few Rama-centric sects, he is considered the Supreme Being, rather than an avatar. This beautiful sculpture is a painstaking representation of the Ram Darbar, giving us a glimpse of the handsome Lord Ram giving darshan along with his consort and brother, Lakshman. Rama, one of the dasa avatars (ten incarnations) of Shri Mahavishnu, holds his huge bow on his Ajanu Bahu (strong shoulder), while he blesses his devotees with the abhaya hasta (gesture showing protection and succor) on the right. Ram is a picture of peace and shanty (serenity) as he blesses all his devotees. His consort, Sita, stands at his left side. The delicate Devi also showers her blessings on all those who bow down to her. Rama's brother, Lakshmana, stands alongside, and is ever ready to act as per his brother's orders. Ram's faithful attendant, the mighty Hanuman, sits at his feet with devotion. 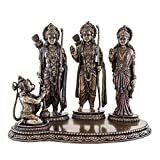 eSplanade 5.5" Premium Brass Ram Darbar - Lord Ram, Goddess Sita with Lakshman and Hanuman, made of 100% solid Brass for your Home/ Workplace/ Office/ Desk/ Gifts etc. Place them at Working Desk or Temple at home. Best for gift. You can use this also as Decorative purpose. This product is 100% handmade by skilled Artisans. We support Artisans and want to conserve the arts & crafts of old times. Insist on eSplanade Brand for best quality products and buy directly from eSplanade. 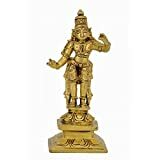 From the house of eSplanade - This is a beautiful, unique & gorgeous hand work on solid metal brass figure of hindu god. 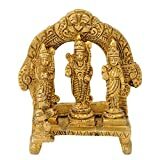 Bless your place and heighten the beauty and spirituality of your house or work place with this Handmade Ram Darbar Sculpture. Rama is the seventh avatar of the Hindu god Vishnu,and a king of Ayodhya. Rama is also the protagonist of the Hindu epic Ramayana, which narrates his idealistic ideas and his greatness. Rama is one of the many popular figures and deities in Hinduism, specifically Vaishnavism and Vaishnava religious scriptures in South and Southeast Asia. Laksmana is the younger brother and close companion of the god Rama, the hero of the epic and avatar of the god Vishnu. Lakshmana was highly skilled in the science of archery and could loose five hundred arrows in one shot. Sita is the central female character of the Hindu epic Ramayana and a daughter of King Janak of Janakpur.She is the consort of the Hindu god Rama and is an avatar of Lakshmi, goddess of wealth and wife of Vishnu. Sita is known for her dedication, self-sacrifice, courage and purity. Place this calm art piece in your living room for an effervescence beauty or gift it to your loved ones before he/she enters a new phase in life. It represents the power of the Supreme Being who removes obstacles and ensures success in human endeavors. Complete the decor of your home in the utmost of style or add some Indian flair to your living room decor. Order this Handmade Ram Darbar Sculpture today!